Those were the first two options that came to my mind as I crested a hill in Northern British Columbia and saw this creature far off in the distance. Thankfully, it stuck around long enough for me to get closer and as it moved out into the open it became clear that it was a red fox (Vulpes vulpes) with an unusual coat. 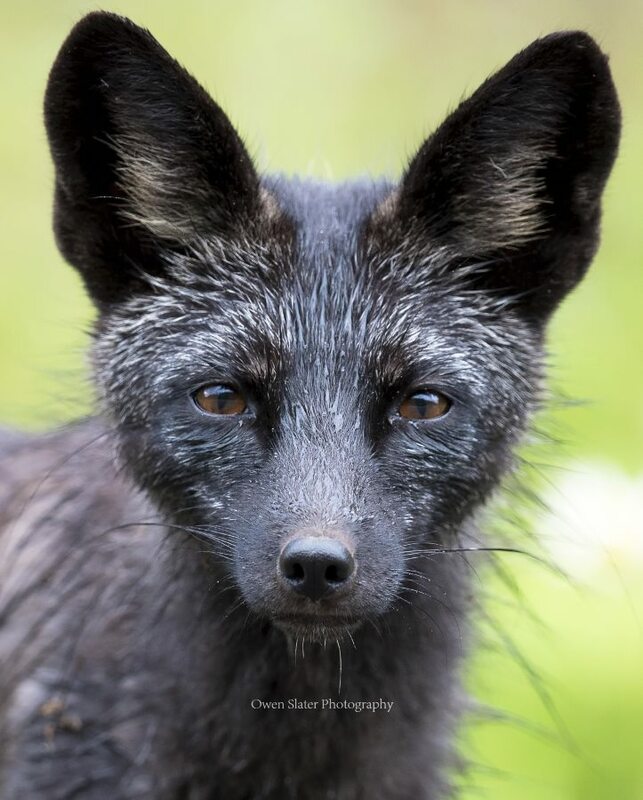 I’m not sure if the experts would call this a silver, black or cross fox? 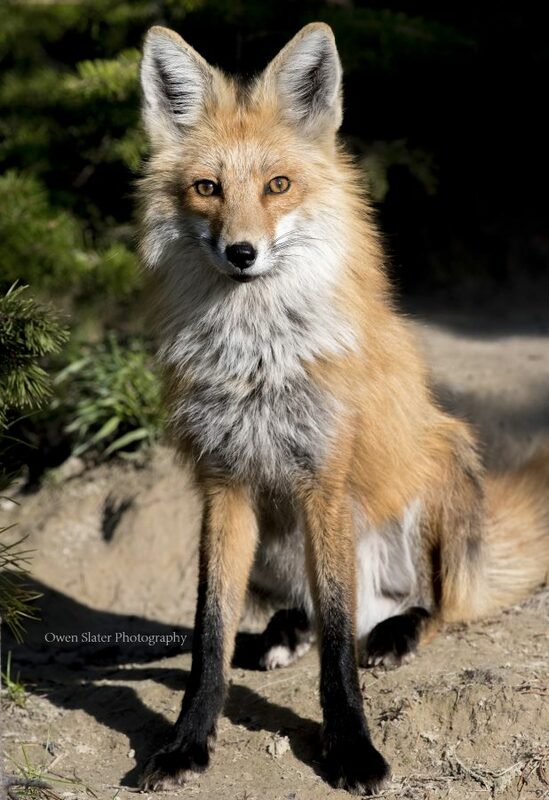 There are 8 genes responsible for coat colour in foxes and depending on which genes have dominant or recessive coding, there can be over 80 different colour combinations. 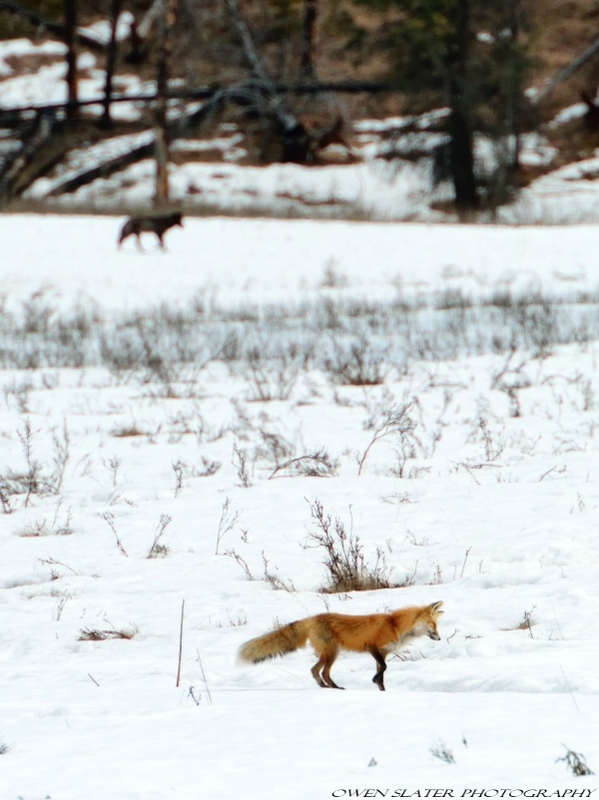 Maybe just a coincidence, but I’ve only ever come across red foxes with unusual coats when I head further north. This one seemed almost as curious about me as I was of it, giving me this questioning look before we both moved along. Photographing wildlife in their natural environment can be very frustrating with many hours sitting and waiting with no results to show for it. Often times there may be beautiful light but the animals are not around and other times it’s the reverse. On the rare occasion when both light and wildlife come together, the hours of patience seem worth it. This red fox had just returned to the den to deliver a freshly killed rodent to the hungry kits and as the kits ran off with their meal, the adult sat down and stared at me. Up until then it had been mainly overcast, but as it overlooked their territory the sun briefly broke through the clouds and created a spotlight of soft light just long enough for me to get this photo. Gotta love it when everything comes together like that! 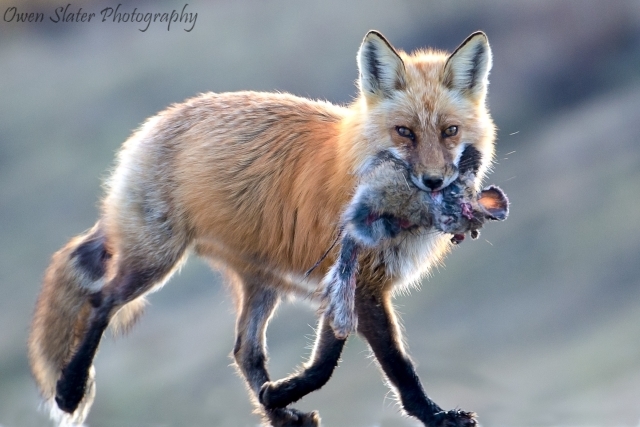 The morning after photographing Fire Fox the same fox, now several miles from where I first found it, was feasting on a snowshoe hare. After burying a few mouthfuls to lighten the load, it neatly folded the rest into a bundle and made the long journey back to the den to serve breakfast to its family. 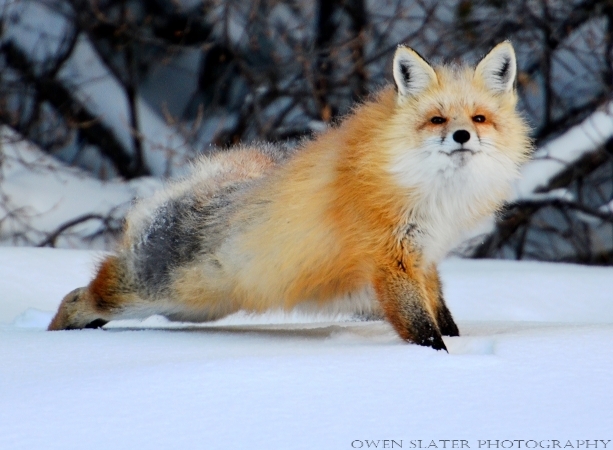 After waking up from a nap, this female red fox stretched out and struck a pose as if she were competing for best in show. She gets my vote! A wolf was hunting for rodents in the back of this meadow when a red fox nonchalantly trotted into the middle of the meadow right in front of the wolf. Since wolves are known to kill other carnivores if they come across them, I expected to see either the fox quickly run and hide or the wolf chase after and try to kill it. Instead they both just glanced at each other and then almost in unison, they resumed hunting. For several minutes they mimicked each others hunting stance, before the fox decided to move on and look for prey elsewhere. A profile shot of the uniquely coloured ‘cross’ fox as it trotted along the crusted snow. 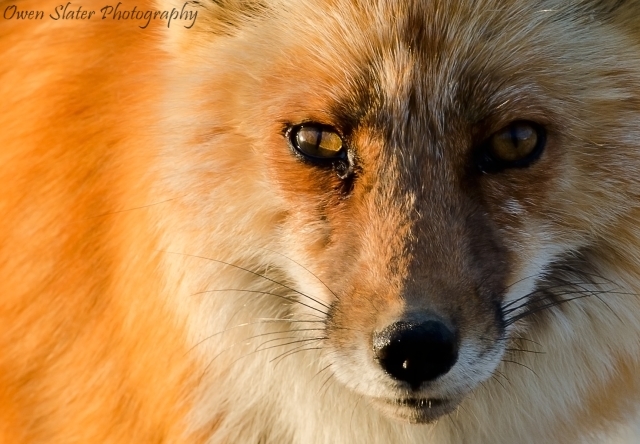 I came across this uniquely coloured fox just outside of Whitehorse. 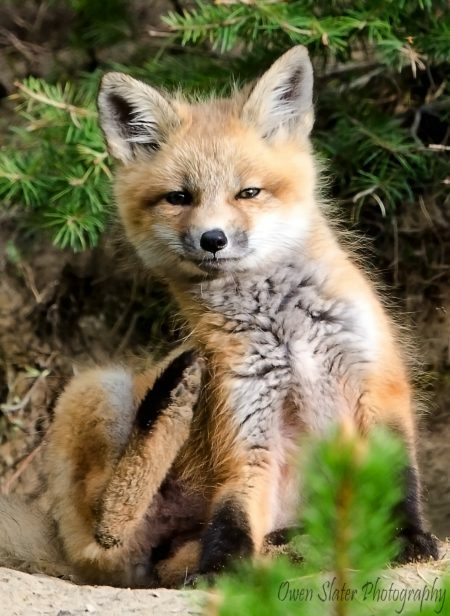 Red fox colouration can vary from their typical appearance to almost completely black. This one was a cross between the two and hence the name “cross fox” that is assigned to this naturally occurring variant.